I was playing CSGO when my system crashed. When I tried to restart, the "Windows Starting" logo sat there. Eventually, I got tired of restarting the computer just to get a standing screen. So I used the Windows repair, which, of course, did not have any system recovery points. I tried booting into safe mode, but it stopped at "Class..."sys (I forgot). So I have no idea what happened, but after retrying safe mode for a while, the F8 key didn't work anymore. Assuming this was a registry error of some sort, I used multiple bootable AV and corrupt registry scanners, but each time they didn't show anything. I tried the one suggested on the forums, but it just deleted 2 adware programs. I honestly don't remember how to fix this problem. And it seems to be grub, linux, and windows problem. Help appreciated, thanks. Btw: I screwed up the Ubuntu graphics driver a while back, so if I need to use Ubuntu again. There's that problem. Edited by Korimon, 27 January 2015 - 08:28 PM. Please provide information about your computer, this includes is it a notebook or desktop, is it a custom build or brand name such as Dell or HP, if it is a brand name provide the model name or series number (not serial) if a custom build post the brand and model name or number for the MB, Ram (including the amount) add on video card if one is used and the PSU (power supply unit) providing these details will enable us to better assist you. Edited by Korimon, 08 February 2015 - 10:20 PM. If the downloaded file is the .iso type use ImgBurn to burn the .iso file to a DVD/CD disk depending on your OS (select "Write image file to disc" option) and make the disk bootable. Note: If you're viewing the Large icons or Small iconsview of Control Panel, you won't see this link so just click on the Administrative Tools icon and skip to Step 4. 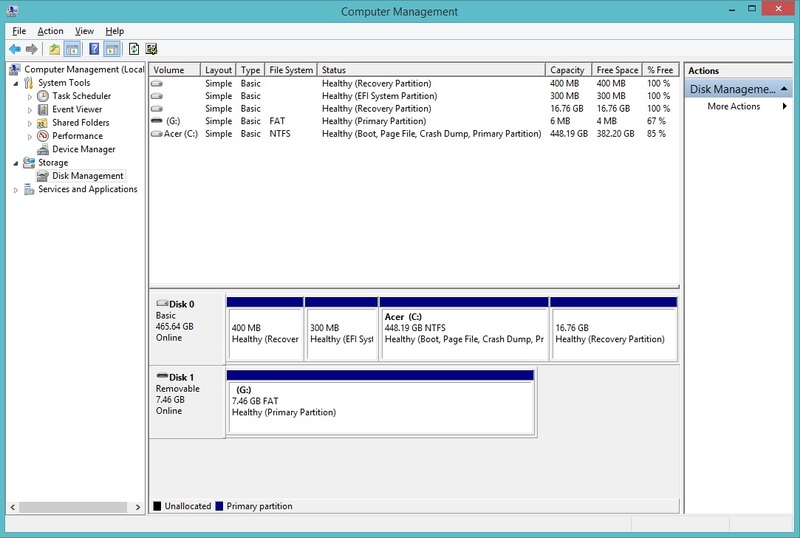 Note: If you don't see Disk Management listed, you may need to click on the |> icon to the left of the Storage icon. Not heard back from you Korimon, do you still require assistance or is the issue resolved, please update or conclude your thread and not leave it hanging. I apologize for not getting back yesterday. Really busy month. But, yes, I still need assistance. I haven't had much success. Is there a way to do it? Thanks, the files are now written. Edited by Korimon, 18 February 2015 - 12:48 AM. You are welcome but may I ask do you mean the Seatools for Dos, if yes have you run any tests yet. 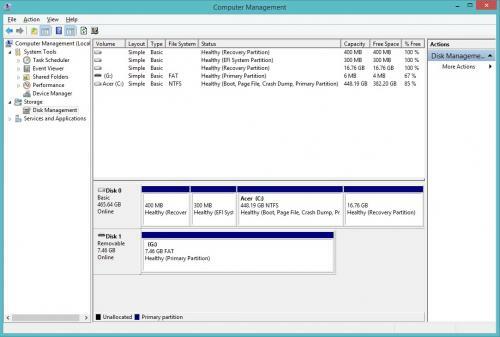 Nothing drastic shown in Disk Manager but I will mention that there are two recovery partitions showing, this can be confusing when you need to use the correct one. I booted the USB drive, and the SeaTools showed up. (G: Drive, that USB Recovery Partition). However, it said "No hard drives found". It seems that after I click "Exit", there must be some C:/ drive, but SeaTools probably doesn't recognize it. Have you made any progress with this Korimon, an update or conclusion of the thread would be appreciated. I'm sorry for not replying in a week. However, I've made up my mind to delay this problem til next time. It's not your problem, but that I have bought a newer one, and the only thing worth saving is probably the hard drive. When I have more time, I will come back. Thanks for being so patient and understanding. No problem and thanks for the update.